Pakistan beats India in ‘gift diplomacy’! WASHINGTON: The one-upmanship between India and Pakistan may have become a no contest now with New Delhi’s economic and strategic leap forward, but there is one area where Islamabad is still a clear winner. Its munificent leaders are by far the most generous visitors to Washington, lavishing expensive gifts on American government officials from President George W Bush down to unnamed Central Intelligence Agency (CIA) officers. A list of gifts accepted by US officials from foreign government sources in 2004 published in the Federal Register last week shows that Pakistan outdid most countries in the world, gifting US officials carpets, rugs, shawls, jewellery and antique pieces. 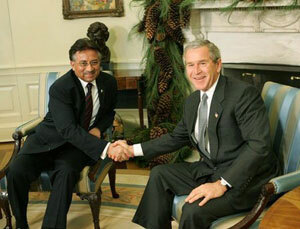 Pakistan’s ‘gifting’ diplomacy starts right at the top with President Pervez Musharraf presenting Bush with a dark wood table inlaid with bone valued at $1,400, an antique muzzleloader from the 1800s, a cream wool Pakistani coat and a hat, during his December 2004 visit to Washington, DC. Sehba Musharraf gave First Lady Laura Bush a gold light and dark pink garnet and pink tourmaline chandelier earrings, and a 17” light and dark pink garnet and pink tourmaline beaded necklace. In contrast, when Prime Minister Manmohan Singh met Bush in September 2004, he gave him a round marble tabletop worth $550.